According to the United States Food & Drug Administration (FDA), “surgical staplers and clip appliers are complex mechanical medical devices that have been on the market for years and are mature in their technology. These devices are used in gastrointestinal, gynecologic, thoracic, and many other surgeries to remove part of an organ (resection), to cut through organs and tissues (transection) and to create connections between structures (anastomoses). The benefit of using these devices allows for more complex procedures and shorter surgical procedure time.” The global surgical staplers market was valued at around US$ 2 Bn in 2017 and is anticipated to reach more than US$ 4 Bn by 2026, registering a growth rate of 7.5% during the forecast period. Rise in demand for minimally invasive surgery, increase in adoption of surgical staplers against surgical sutures in developed as well as developing countries, and technological advancement in the sector are the major factors expected to drive the growth of the market in the near future. Surgical staple sutures are preferred by surgeons for wound closure on account of several advantages as compared to surgical sutured. Surgical staplers have the advantage of being more economical, quicker, and cause fewer infections than stitches. However, functional failure of surgical stapler during surgical procedures and availability of alternative procedures in the market are some of the factors hampering the growth of the market. According to FDA data, over the past five years, there have been 8,000 to 9,000 adverse events reported every year related to surgical staplers, out of which, 90% were malfunctions, 9% injuries, and less than 1% deaths. The frequently reported device problems were: staples did not form, staplers misfired or failed to fire, and separated suture lines. Emerging economies in Asia Pacific, Latin America, and Europe offer significant opportunities in the surgical staplers market due to increasing population and high unmet medical needs in these regions. Emerging countries in Asia Pacific and Latin America have a moderate adoption rate on account of low awareness among patients. Hence, rise in awareness in the next few years regarding innovative surgical staplers is likely to help the market ensure sustainability. The global surgical staplers market has been analyzed on the basis of product type, application, technology, ergonomics, end-user, and geography. Among products, disposable surgical staplers are expected to dominate the market. Low chances of cross infection, no need for cleaning or sterilization, and ease of use are some of the factors driving the disposable staplers segment. The technology segment of the market is divided into manual and powered devices. 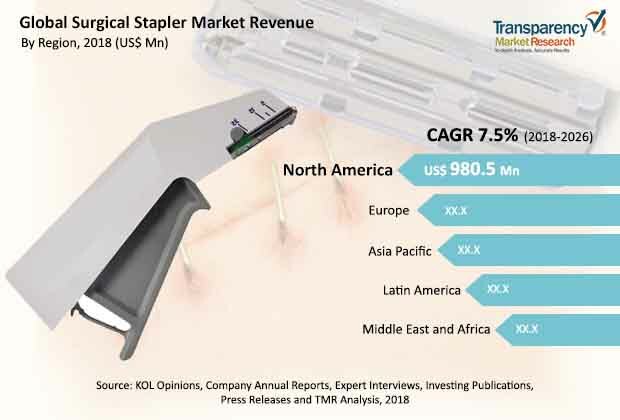 The manual devices segment held more than 70% share of the market in 2017 owing to availability of several manual stapler brands across the world. The general surgery application segment of the global surgical staplers market is expected to register a growth rate of around 7% during the forecast period. Increasing geriatric population and rising prevalence of diseases among the elderly people are likely to boost the demand for surgical staplers during the forecast period. Among end-users of surgical staplers, the hospitals segment is expected to dominate the market during the forecast period. The segment is expected to reach a value of around US$ 3 Bn by 2026. High number of surgical procedures are performed in hospitals and is one of the key reasons supporting the growth of this segment. Geographically, the global surgical staplers market has been divided into North America, Europe, Asia, Latin America, and Rest of the World. North America and Europe are expected to hold a major share of around 70% of the surgical staplers market during the forecast period. Technological advancements, growing geriatric population, and rising number surgical procedures performed in these regions are likely to drive the surgical staplers market in North America and Europe. The surgical staplers market in Asia Pacific is anticipated to grow at a significant CAGR of 8%. Increasing awareness and adoption of advanced surgical products and rising number of surgical procedures performed in China are projected to boost the growth of the market in the country during the forecast period. The global surgical staplers market is highly consolidated, with the presence of a few large-scale public and private medical devices companies. The market is dominated by a few players based in the developed countries. Covidien Plc. (now a part of Medtronic Plc.) and Johnson & Johnson Services, Inc. (Ethicon Inc.) are the key players operating in the surgical staplers market, holding around 80% of its share. Purple Surgical International Ltd., Victor Medical Instruments Co., Ltd., Grena Ltd., Golden Stapler Surgical Co. Ltd, Becton, Dickinson and Company, Smith & Nephew, B. Braun Melsungen AG, XNY Medical, Frankenman International Limited, and Dextera Surgical Inc., etc. are the other significant players operating in the global surgical staplers market. As India and China represent two of the fastest growing economies in the world, successful penetration of these markets can generate profitable opportunities for companies. This report on surgical staplers market analyzes the current and future scenario of the global market. Increasing awareness and adoption of advanced surgical products, easy availability of innovative products, rising number of surgical procedures, growing geriatric population, and upsurge in the prevalence of obesity across the world are expected to drive the surgical staplers market during the forecast period. However, functional failure of stapling devices during surgical procedures, availability of alternative procedures in the market, and gap of understanding among surgeons regarding the safe use of surgical staplers are anticipated to hamper the growth of the surgical staplers market during the forecast period. The report comprises an elaborate executive summary, which includes a market snapshot that provides information about various segments of the market. It also provides information and data analysis of the global market with respect to segments based on product, application, ergonomics, technology, end-user, and geography. A detailed qualitative analysis of drivers and restraints of the market and opportunities has been provided in the market overview section of the report. In addition, the section comprises competitive matrix and company profiles with business overview to understand the competitive landscape of the market. It also provides market attractiveness analysis, by geography, and market share analysis, by key players, thus presenting a thorough analysis of the overall competitive scenario of the global surgical staplers market. The product type segment has been fragmented into disposable surgical staplers and reusable surgical staplers. The product segments have been analyzed based on available marketed products, revenue generated by products, and market share analysis of key players operating in the market. The application segment of global surgical staplers market has further been divided into general surgery, colorectal, gynecology, urology, and other applications. The application segment has been analyzed based on number of surgical procedures performed globally. Market size and forecast for each of these segments have been provided for the period from 2016 to 2026, along with their respective CAGR for the forecast period from 2018 to 2026, considering 2017 as the base year. Based on technology, the global surgical staplers market has been segmented into manual devices and powered devices, while in terms of ergonomics, the market has been divided into curved, linear, and others. The market segments have been analyzed based on product portfolio, rate of adoption of technology, ASP of the product, and application of products. Market size and forecast for each of these segments have been provided for the period from 2016 to 2026, along with their respective CAGR for the forecast period from 2018 to 2026, considering 2017 as the base year. Based on end-user, the global surgical staplers market has been segmented into following categories: hospitals, ambulatory surgical centers (ASCs), and others. Market size and forecast for each of these segments have been provided for the period from 2016 to 2026. The report also provides the compound annual growth rate (CAGR) in percentage for each segment for the forecast period from 2018 to 2026, considering 2017 as the base year. Geographically, the global surgical staplers market has been categorized into five major regions and key countries in respective regions: North America (the U.S., Canada), Europe (the U.K., Germany, France, Spain, Italy, and Rest of Europe), Asia Pacific (India, China, Japan, Australia, and Rest of Asia Pacific), Latin America (Brazil, Mexico, and Rest of Latin America) and Middle East & Africa (South Africa, Saudi Arabia, and Rest of Middle East & Africa). Market size and forecast for each of these segments have been provided for the period from 2016 to 2026. The report also provides the CAGR % for each segment for the forecast period from 2018 to 2026, considering 2017 as the base year. It also covers the competitive scenario prevailing in these regions. The report profiles major players operating in the global surgical staplers market based on attributes, such as company overview, financial overview, product portfolio, business strategies, and recent developments. Major players operating in the market are – Covidien Plc. (now a part of Medtronic plc), Johnson & Johnson Services, Inc., Smith & Nephew, B. Braun Melsungen AG, XNY Medical, Frankenman International Limited, and Dextera Surgical Inc.